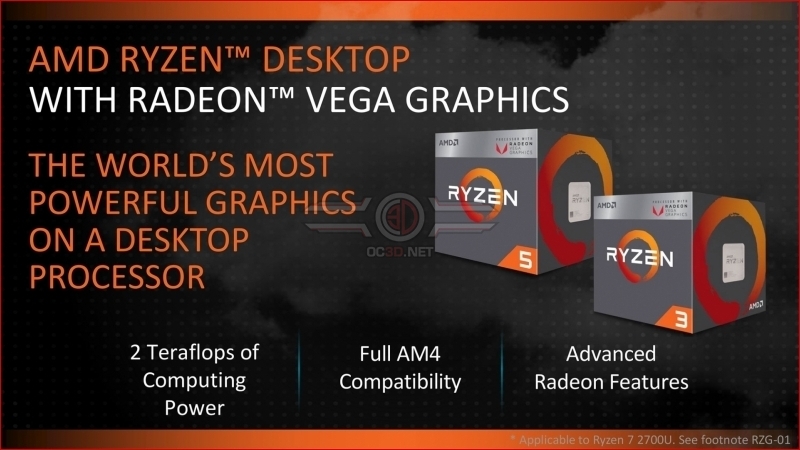 Read more about AMD's 2000G series of Ryzen APUs with Vega graphics. Is it me, or are they literally giving Vega away for free with this? That is what it looks like, though it is likely that the Zen 2nd Generation CPUs that replace the higher-end models will offer higher clock speeds. At least that is how I see AMD compensating for this. A little more L3 cache is another option if the non-G variants continue to use the full phat (Zeppelin successor) dies, however I think this is now unlikely as it would have a completely different CCX layout vs the G parts(Which is also likely a contributing factor to the 2XXXG parts faster CPU perf.) slightly higher clocks and maybe a £5 discount compared to a G part. I'm assuming the full-phat dies yields are now strong enough that all the 2+2 CCX dies can be used in the X500 part(2+2 is a requirement for the larger L3 cache) with lower 2XXX parts using APU-derived dies(With 1 whole CCX). Any large dies that don't meet the 1500 requirements can still go to Epyc parts. It's too early to laugh..